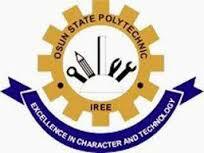 Osun State Polytechnic, Iree Daily Part-Time (DPT) Acceptance Fee Payment Amount, Admission Letter Printing Notice for Newly Admitted / Fresh Students for 2018/2019 Academic Session. All candidates offered provisional admission into the Osun State Polytechnic, Iree Daily Part-Time (DPT) programme for the 2018/2019 academic session are hereby informed that the payment of acceptance fee has commenced. The new students are urged to pay their acceptance fees within the next two weeks. NOTE: OSPOLY DPT Admission Application Form is still available for sale at the aforementioned bank at a sum of Ten Thousand Naira .